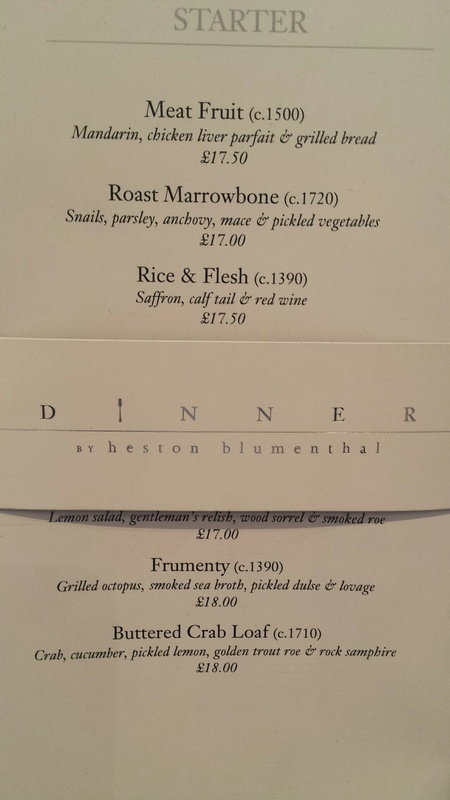 Dinner By Heston Blumenthal. Photo courtesy of the Internet. NHYM 2015. 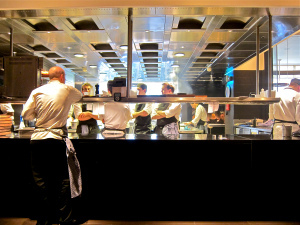 The Kitchen, Dinner by Heston Blumenthal. Photo Courtesy of the Internet. NHYM 2015. A formal evening meal, typically one in honour of a person or event. Dinner unfortunately has a lot to live up to: this year it was rated No. 7 Best Restaurant in the World, it has earned two Michelin stars, and was rated 3rd best restaurant in the UK 2015. I went to dinner at Dinner the other night (which, by the way, is really annoying to say), with very high expectations. It’s not the restaurant’s fault, but every critic and journalistic review about this restaurant just gushes about how wonderful it is, so I was feeling dubious about the whole experience. Nothing can live up to its reputation, surely. 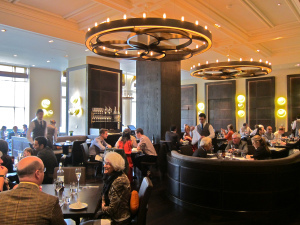 I remember going to my first Gordon Ramsay restaurant at Claridge’s probably 15 years ago and all I remember about it was that it was a terrible let-down. I don’t remember the food, not the room, not the atmosphere. Just that there was nothing memorable about the experience. So, going to another celebrity-chef restaurant full of accolades and applause left me a little lukewarm. 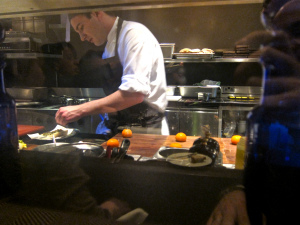 Chef preparing The Meat Fruit. Photo Courtesy of the Internet. NHYM 2015. Heston is known for his chemical-food wizardry, creativity and innovation, which made the Fat Duck Best Restaurant in the World in 2005. I read that this restaurant was going to be a very different experience. Where the Fat Duck is an ‘experience’ of theatricality and surprise, Dinner was meant to be somewhere you would want to go back to over and over for a nice meal rather than a once-in-a-lifetime experience. The whole point of Dinner is to re-create old (ancient) British dishes in new, modern and creative ways. Having seen some of Heston’s magic tricks on TV, I was looking forward to some kind of experience (so many restaurants dish out the same dishes over and over that lack any creativity). Starter: Meat Fruit (c.1500) Mandarin, chicken liver parfait & grilled bread. The Meat Fruit. Photo Courtesy of the Internet. NHYM 2015. Neither myself nor Mr. X are particular fans of chicken liver parfait, but when in Rome… It is one of the ‘Cult Classics’ of this restaurant, so not to be missed. This dish is really a feast for the eyes. His Mandarin look-alike is really quite stunningly perfect as food-behaving-like-other-foods (and very appropriate eating it in the Mandarin Oriental). It is worth ordering just to see the mastery that comes with creating this dish. It is good, but it was never going to completely win us over in terms of taste. But even Mr. X was impressed by the artistry involved in creating the dish. Frumenty, photo courtesy of the internet. NHYM 2015. The grilled octopus was perfectly cooked and chargrilled, lifting the salty, sea flavours out of the octopus. 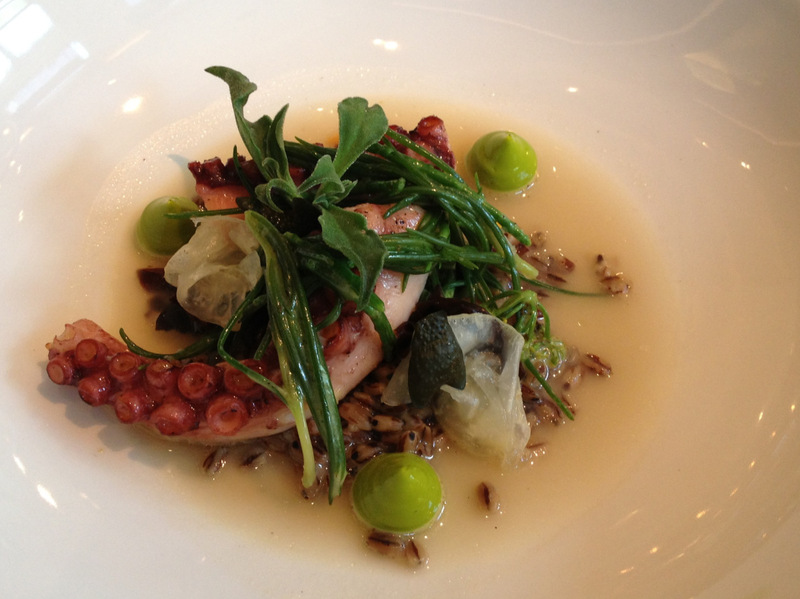 The ‘lovage’ (some kind of plant) was interesting, but for me it was all about the octopus itself. I skipped the sea broth etc.. which left my palate as I wanted it. Personally, I didn’t need all the extra garnishes. The Pork Chop. Photo Courtesy of the Internet. NHYM 2015. 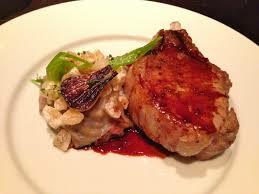 The pork chop was delicious. The quality of the meat immediately stood out. It was really tender and perfectly cooked and seasoned. Again, I didn’t need the added sauces etc… as I thought the meat to be perfect on its own. The smoked cabbage was a nice addition, but didn’t particularly need the confit onion, apple & mead. The Tipsy Cake. Photo Courtesy of the Internet. NHYM 2015. 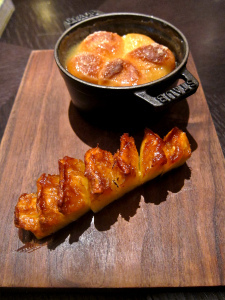 The Tipsy Cake is another ‘Cult Classic,’ which I couldn’t resist ordering. It was served with spit roast pineapple, rendered sweet and salty on the spit. The doughy, sherry- soaked, sponge cake was full of sweet yet soft flavours, reminding me of my carefree childhood of devouring indulgent cakes in the backyard without the worries of muffin-tops and middle-aged-post-baby-fat. Ice Cream Machine, photo courtesy of the internet. NHYM 2015. Unlike many two star Michelin restaurants, there weren’t amuses bouches and palate cleansers in between each dish, which was a pleasant surprise. This makes it easier to come for a quick meal rather than a 3-hour sit-down extravagance. The service was great in that the servers were brilliant, knowledgeable, helpful and enthusiastic. It did mean they were a bit slow at times, but it was made up by our waiter’s charm and expertise. The room is a bit bland, but it is a 5 star hotel so can’t digress too much from the mainstream to please a demanding and varied clientele. Finally, the food is really, really well executed, researched and cooked. Some of the added flavours were not to my liking, but I just didn’t eat what I didn’t like. I am too old for feeling like I need to eat everything on my plate, even things I don’t like. I am pleased that this restaurant wasn’t a let-down. I would happily go back and have the exact same meal over and over again, which I think was Heston’s intention with this restaurant. 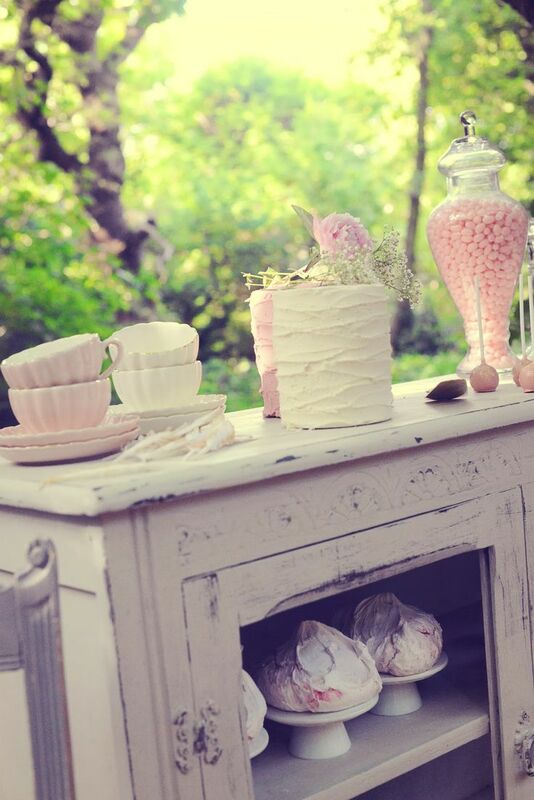 Now that I’ve found a good formula of starter-main-dessert, I would find it hard to break away from it. The price is quite similar to very pricey restaurants in London: Chiltern Firehouse/Arts Club etc…so not a deterrent for superior cooking. 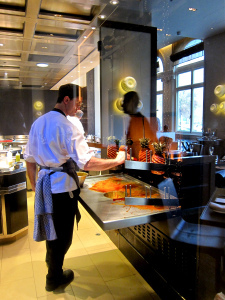 Hats off to Heston and his team, helmed by the chef Ashley Palmer-Watts who runs the kitchen. 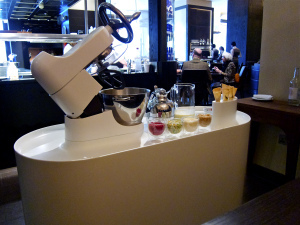 It’s a foodie destination with some theatrics, some excellent cooking, and some flaws, but overall, I was won over and have become a devotee of the Heston-Cult. Chef preparing the Pineapple of the Tipsy Cake. Photo courtesy of the Internet. NHYM 2015. These days I seem to spend every Saturday and Sunday carting my two kids to various Birthday Parties at various venues across London. Recently, I had triple birthdays in one weekend: one Sat am, one Sat pm and two Sunday pm. (I had to devise a hierarchy of needs for the Sunday pm parties: whose party do I really need to go to?) Is this what my life has been reduced to? My toddler’s social life being more booked than mine?. I am torn between my egoistical self and my maternal self that needs to provide to my children’s happiness first. Then, for my children’s birthdays, I have to reciprocate and throw a party for all the people who have invited us, whether I want to or not, to avoid personal social suicide and my children becoming social pariahs. This becomes 42 parties a year, and 42 children + 42 parents to invite for a grand total of 84 mouths to feed and entertain (not to mention the siblings that are undoubtedly brought along and the occasional daddy), which equals to exhaustion and unimaginable stress for me for months ahead. I have always been sensitive about Birthday Parties. This likely stems from my early Freudian (all our issues really are due to our childhoods), traumatic experience when I had only one person (my neighbour) show up to my 6th birthday party out of my class of 30. Granted, I had just moved to a Muslim country 10 days before and didn’t know anyone or the usual customs, where no one seemed to throw birthday parties or go to people’s homes they didn’t know. So, I think I have a good enough reason to be obsessed and fear-stricken about throwing a birthday party and having no one show up. All I ever wanted growing up was someone (anyone) to attend my birthday party to throw a hot potato or play musical chairs with me. Times have certainly changed and children’s parties these days are a whole extravagant, creative and OTT affair competing with Bat Mitvahs and Weddings, but which are a yearly, recurring affair (and sometimes a few times a year, depending on how many children you have). So where do the famous, the rich and the Notting Hillers celebrate their kids’ birthday parties? 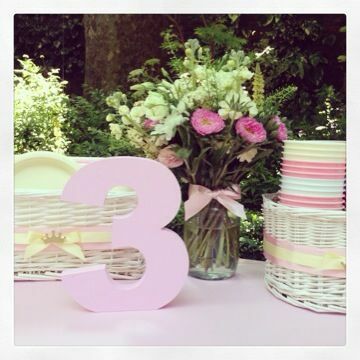 The Notting Hill Mums (as do the Chelsea Mums, Belgravia Mums, South Ken Mums and all West London Mums) all compete with each other to throw a worthy birthday party for their gorgeous, perfect, little angels (or brats). Venues are booked months in advance. Party bags are made artfully from internet websites or party organisers. The catering is organised, kosher, halal, sugar and fat free. 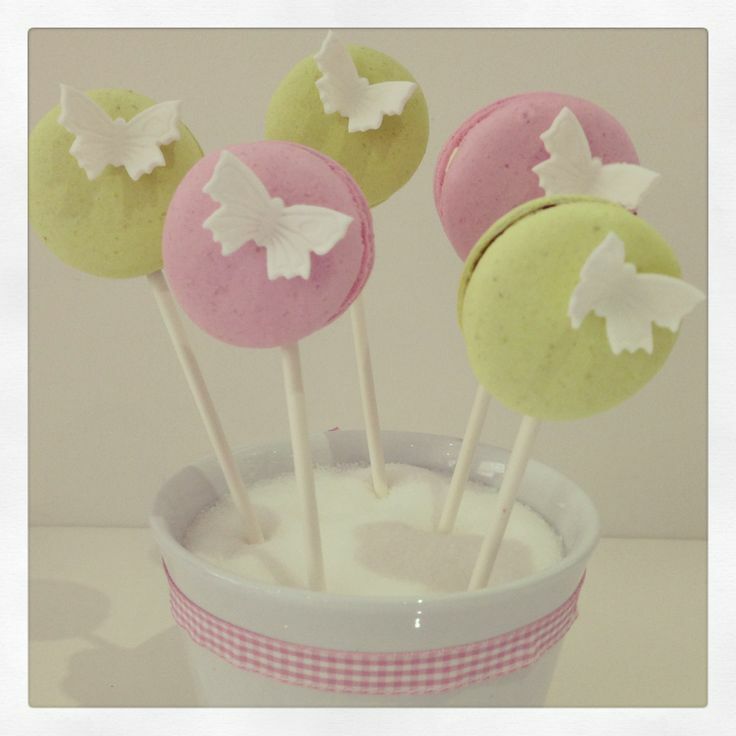 For the NHYM chef-wannabes, cupcakes and cakes are made-with-love, gluten free, low sugar, low fat. Favourite venues include church halls for the under 3s, The Commander for standard NHYM great parties, RS Currie for smaller but lovely, well organised parties, and the Harbour Club for active kids. Cinemas are popular with older kids, when the entire Electric Cinema will be booked or one of the screens at The Lounge will feel like a like a private view. Outdoors, Private Gardens are used to blow up Bouncy Castles and the Princess Diana Playground is taken over by 30 kids running wild. Battersea Zoo is one of the more original and cute venues. If it rains, Private Member’s clubs like Purple Dragon and Maggie & Rose are available, perfectly organised without you having so much as lifting a finger. One NHYM rented out the whole of the Arts Club 1st floor, which is still being talked about at the Arts Club. Then there are the Entertainers and the theme: Mickey Mouse, Minnie Mouse, Princesses, Superheroes, Pirates, Star Wars in a warehouse, Fireman Sam and the list goes on. Eventually, it is a blurry vision of what the child originally wanted and what a NHYM’s ‘creativity’ and ‘imagination’ runs away wildly with. The most original party bag gift I have heard of was a goldfish. But, what does one do with a goldfish?! Flush it down the toilet, let daddy eat it or keep it alive by researching ‘how to keep a goldfish alive’ for hours on the internet and then buying 100’s of pounds worth of kit for it to survive? And what to do with the goldfish whilst on holiday? And what do you tell your sweet little boy Max when his goldfish dies? That he went back to his home in the sea? That Daddy flushed him down the drain? All the stress and these questions would drive me absolutely nutty. Now, the excessively rich all seem to love throwing birthday parties in Hotel Ballrooms. The Berkeley Hotel, the Mandarin Oriental, The Dorchester and the Kensington Hotel all come to mind. We were once invited to an amazing party at one of the above Ballrooms, which happened to be the best birthday party I had ever been to. Ever. Adult or Child. 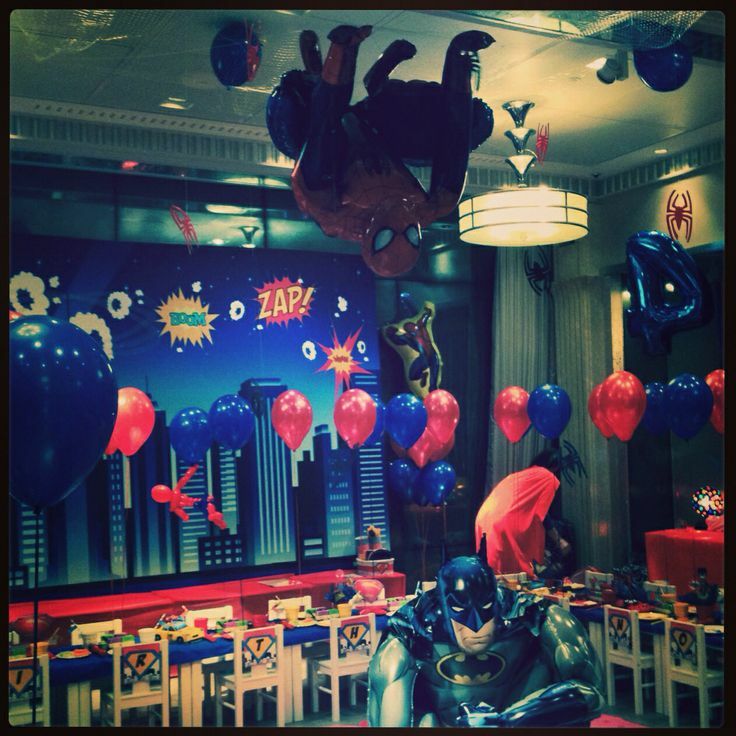 (Forget Adults Birthday Parties, I just want an invite to kids’ birthday parties these days. Actually, I want one of these parties for myself). This was a 3rd birthday party and the theme of the party was ‘Willy Wonka & the Chocolate Factory.’ Every child received an invitation with a chocolate bar and a Golden Ticket inside, which served as the invite, written in golden leaf. 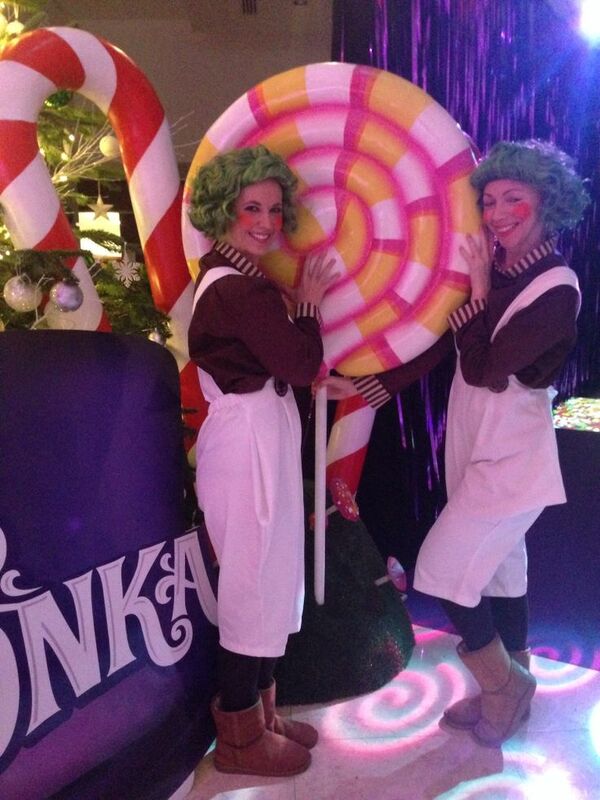 As you arrived into the Ballroom, Giant-sized Oompa Loompahs welcomed us with giant lollipops. The Ballroom was decorated as a Chocolate Factory, with chocolate fountains flowing with marshmallows on sticks to dip them in. There were cotton candy machines, ice cream vans, and popcorn machines everywhere you looked. There was a giant bouncy castle almost touching the ceiling of the ballroom with a slide coming down into a ball pit. There were small rides of cars, train carriages, spaceships, and a merry-go-round. All for free! M kept asking if I had a pound coin to put in the rides, and when I told her we didn’t need any and she could go as often as she wanted, she didn’t know what to do with herself or where to go. Her eyes kept getting bigger and bigger as she looked at all the rides and sweeties for her to devour. This was Disneyland in a London Hotel! There were entertainers and balloon sculptors, face-painting and a magician. 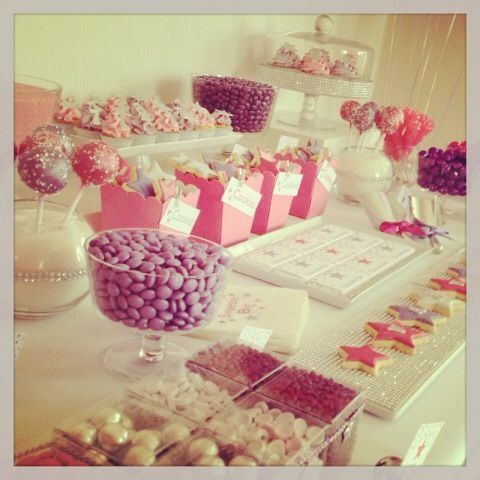 There was a an entire table full of cupcakes, candy, and chocolate bars. (Hello caries and dentist visits, goodbye our bank accounts when M was going to request a party like this). Then as we left, after having had the time of our lives, guilt and shame hit, when we looked into the party bag and realised it was more expensive than the gift we had bought the child. 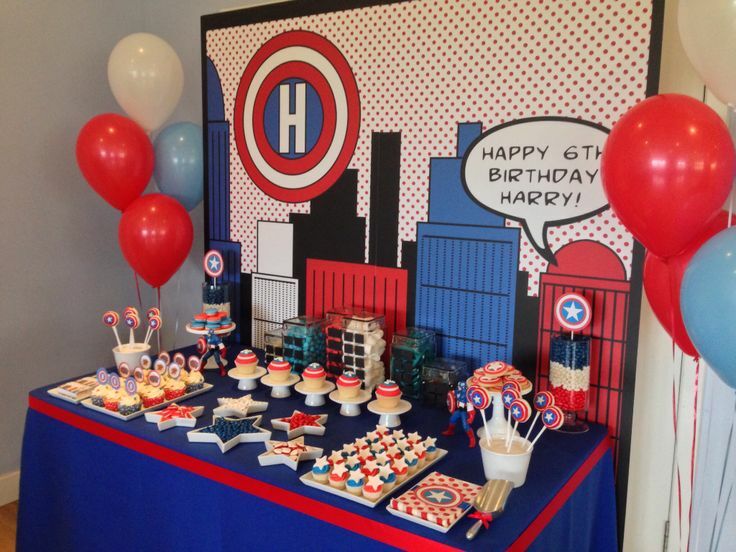 Another, rather ridiculous, super-rich birthday party across the pond in the US was thrown for a 5 year old on his parent’s private jet. But the private jet was parked in a hangar! What’s the fun in that? At least give us a ride! Let’s take this baby for a spin! Although this was a drop off party, somehow, most of the parents decide to stay and oggle at the jet, while the owners happily showed off their dripping, nouveau riche, wealth. 1) The A-List Actors: You receive a phone call 2 hours before the party and are asked: ‘Are you X’s mother?’ Two hours later, after ditching the hierarchy of needs and the other party your child was invited to, you find yourself in a massive Dorchester Suite surrounded by other Hollywood Actors and their progeny singing ‘Happy Birthday’ to their exceptionally beautiful and charming children, friends and entourage. 2) Rock ‘N’ Roll Royalty: To go against the grain, the Rock ‘N’ Rollers throw their party at Bramley’s, which is clearly a rebellion against the excess of the other rich and famous crowds. Their famous friends are too cool to even say ‘hello’ to you, even after an introduction by the R’N’R hostess. 3) The English ‘Golden Couple’: For their child’s 15th Birthday, the whole family and friends (20 of them) have dinner at Nobu Park Lane. I am not sure whether this is a good thing or not. I just hope the child managed to have a teenagers party of booze and hookups instead of choosing lobster tempura or which roll to order in a restaurant full of ‘old’ people. But what happens the following year, when you are competing against your own amazing party in a Hotel Ballroom? And what will these children expect for their 16th Birthdays (One boy has been promised a Ferrari for his 16th but still doesn’t have his driver’s license. Really?!)? What has been your most extravagant birthday you’ve thrown or been invited to? What do you think about the craziness of the Birthday Party phenomenon? Good or Bad? Share your thoughts!